Hey-o! Meaghan coming at you again! Me: So we should get that winner post up on Tuesday, right? Heather: Yep. Want me to do it? I know you're busy. Me: Sure! Here's some photos to use. Me (a week later): Hey, how's that wrap up post going? Heather: Right, I'm on it. Me (a week later again over a pint of beer): DUDE! I'm gonna write that post. And so here we are. A few weeks late but no less enthused about the Penpal KAL that you participated in. We had a wonderful selection of skill levels and colors and a mix of boh fitted hats and slouchy hats. All in all, I think it was a smashing success. Let's take a look at a few of the FO's that were posted on Instagram shall we? Alright, let's get to the winner, shall we? Yes, let's shall! The winner of the Penpal KAL is... *drum roll*.... @JURIFACE!!! Congrats, Julie. Your hat is lovely. As a prize (and a thank you) for participating we're going to ship you a copy of our latest cowl pattern, 1-Skein ZigZag Cowl, along with a skein of our brand new Ewe So Sporty line of sport weight yarn in the color of your choice to complete the project. You can choose your color of yarn by visiting our website Ewe So Sporty page. And here's a sneak peak of the cowl pattern. Julie, please send your mailing address to Heather at hello@eweewe.com and she'll make sure you get your package of happiness shortly! Thank you again to all of you who played along. It was an honor to host this KAL and I look forward to future opportunities to do so again. We're so excited to have our new line of yarn, Ewe So Sporty, hitting the shelves soon. Talk to your LYS to see if they're going to carry it. Heather starts shipping orders on Friday (WOOT!) so it won't be long before your can get your hands on it! Until the next Ewe Ewe Yarns KAL, Happy knitting! Welcome back to the Penpal Hat KAL (aka: the Valentine's Day Quickie KAL). I hope you all enjoyed the first steps. I'm so excited to see progress on Instagram and and love hearing from you all on Ravelry. It doesn't look like much yet, right? But after today's steps it's going to start looking like you're a knitting rockstar! So let's get moving. I hope you're all ready for lots of fun photos to go with today's steps. It was a blast, and a challenge, to accurately show each piece. I hope they're helpful. Right off the bat we're heading into some lace-y territory - YO's and K2tog's. Starting out, we're going to *S1-K2tog-PSSO*... what?! Right-o. It looks a bit wacky and the first time I sat down to try this I did it wrong. So let's walk through the steps so you can avoid the unnecessary frustration of working backwards. S1 - slip one stitch purlwise. Basically you're going to put your right hand needle through the first loop on the left hand needle as if to purl. But you're just going to move the stitch from left to right, no new stitch will actually be created by wrapping any yarn. Did you notice? I painted my nails for you all this time... the last photos were atrocious! The next step is pretty obvious - we're going to K2tog. What you'll notice is that your tail from your last worked stitch - the stitch at the end of the row where we increased our stitches - is running past your slipped stitch. That's ok. It'll all work out in the long run. Next is the PSSO: pass slipped stitch over. Similar to the S1, we're not going to be wrapping the yarn to create a new stitch. We're just going to move an existing stitch around. Using your LEFT hand needle, reach past the stitch you just created with your K2tog, pick up your first slipped stitch and lift it up, up, and over your K2tog stitch and off the end of your right needle. You're doing two things at once by doing this. You're decreasing another stitch (you already decreased one with the K2tog) but you're also starting the design portion of your lacework. See the little collar you now have around your K2tog stitch? But... now we're short two stitches and the goal is to keep the number of stitches consistent around the hat until we start our decreases. So, as is typical in lace, where there is a decrease in stitches, we must create new stitches with YO's. REMEMBER: End the round with the "YO, twice" or you'll be short two stitches for the round. How many times have I forgot to do THAT? Too many to mention. Alrighty - moving on? Yes, I think we shall. Round 2 is a fun one. Or it's fun to me, anyway. Here's where it's easy to lose stitches if you're not paying enough attention. Eventually your hands will fall into a rhythm but at first: eyes down folks. I know the Olympics are on but hit "Pause" for a moment and watch the stitches. Knit your first stitch and then you're facing the double YO you created in the first round. The pattern says: K1, P1 into double yarn over. WHAT? Let's break it down step by step. You're going to K into the first loop (which is gonna be all loosey goosey so hold onto that second wrap) just like you would knit any stitch. See me holding that loop onto the left needle? I strongly recommend this. Not much is keeping that loop on the left needle. If you drop it, fear not. You can just swing your left needle under the line of yarn and pick it up easily enough. I just find it easier not to drop it in the first place. Alright, so now we have to P1 into the second YO. So we're going to bring our working yarn forward, between the two needles as if to purl. It's going to cross over that span of yarn between the worked stitch and the second YO still on your left needle. While holding the working yarn in front it's now time to purl into this remaining loop. Again, it's going to be all loosey goosey on you so don't worry that its wrong. It's not. It's just the "feature" of being a YO stitch. As with any purl stitch, you're going to have to now move the working yarn between the two needles to create your new stitch. Now you can complete the purl stitch and badda boom, badda bing: you've just K1, P1 into the double YO. You'll see a little purl bump to indicate that you've just worked the purl. Once you've done that you're just working those three stitches all the way around your... round?! All the way 'round your round? Ha ha... its great inside my head. Ok. GO! So there you are, knitting along, loving your WIP and there it is... the dreaded tail at the end of your current skein. And you have to join a new one. And weave in ends. Ugh. NO YOU DON'T! The nature of this project, having texture and movement, allows us to use a super-secret join method that will hide itself into invisibility on this project. This does not work for all projects. For example, a stockinette fabric, it's not so great for. Cuz you'll see it. But on reverse stockinette or garter... it's passable. And no, its not the spit-splice. Which I love (albeit I think it's a wee bit gross). But with Ewe Ewe Wooly Worsted it's not really the recommended form of joining. Why not? Because Wooly Worsted is a superwash yarn so you can throw that baby in the washing machine. So, since Wooly Worsted won't felt, it won't splice either since that's pretty much all you're doing when you spit-splice your yarns - felting them together. Ok, enough talk about spit. Let's talk about joining these two ends together without needing to weave. For sample sake, I'm going to use the end of my original color and use a different Wooly Worsted scrap I have leftover from the Stuff It Stocking KAL I participated in this past December so you can differentiate one end from the other. Lay your working yarn end so that your project is in front of you with the tail pointing towards you (this isn't a requirement in the future but will help for purposes of this tutorial). Next, lay the end of the new ball parallel to your working yarn with the tail pointing away from you. You'll want the two ends to overlap one another by about 4". In this case, the working tail is Teal, and the new ball is light blue. Tuck the working yarn UNDER the new yarn so it looks kind of like the number "4". Pull the working yarn back to the left going OVER the new tail, and back over itself again. Tuck the working tail under itself. Pull tight on both ends of the WORKING yarn. The new ball is basically just hanging out with a knot tied around it, not with it. To work the second half of this join, in a similar style to above, take your NEW yarn tail and tuck it under the working yarn so it looks kind of like "P". Pull the new tail back over the working yarn, to the right and over itself again. Tuck this new tail under itself. Pull this one tight again so that you've now got two knots about 2" apart. Now here's the "Magic". We're going to pull these two knots together and create a double knot that is almost impossible to break apart. I say almost because if you really worked at it you could do it, but what I guess I mean is that it'll hold up to washings and wear and you'll love not having to weave in the ends. To create your "Magic Knot" pull on the long ends of both the working yarn and the new yarn. The two knots will slide together and meet up. You can give a pretty good yank on this puppy and it's only going to make it stronger. If you had your Wheaties this morning, don't pull so hard that you break the yarn. But a good yank'll do. Once the two knots have become one (like a little Yarn Wedding) I always give an extra tug on each individual knot. To do that, grab the long end of the yarn, and the short bit of the same yarn, and give it a tug. Do it with both ends. Now, as close to the knots as you can stand... cut the ends off (the short ones... not the working yarn). I'm usually about an 1/8" away from the knot when I cut the short tails. You now have a knot that'll stand up to washing and wearing and because of the form of the hat, you'll never see it. So that' wraps up today's post. It's been a long one but hopefully a good one to keep you moving on your Penpal Hat. It's a great project to work on in front of the Olympics (or Downton Abbey marathons) once you memorize the pattern repeats. Keep knitting per pattern until you reach the desired length for the hat you've chosen. On Thursday, February 13th we'll come back and discuss decreases, finishing and our old friend, blocking! Keep in mind that we're doing a prize giveaway at the end of this KAL. Complete your Penpal Hat using Wooly Worsted yarn by Valentine's Day and you'll be entered into the drawing. What do you win? A skein of the not-yet-released Ewe So Sporty yarn along with a pattern to go with it! How do you get entered? Just show us a photo of your FO using #PenpalKAL on our social media sites linked below, or email us a photo at hello@eweewe.com. Join me and the other KAL'ers on Instagram, Twitter and Facebook using the hashtag #PenpalKAL. And if you've got questions or comments you're welcome to leave them here or connect with us in the Ravelry group. A little present just came from your old friend Ewe Ewe! We've updated our Penpal Hat lace knitting pattern with a hip slouchy version. The knitted lattice stitch on the Penpal Hat gives a funky crochet look with great drape. Perfect! The new version in the photo is knit with Wooly Worsted merino in color Charcoal so it goes with everything. Make your own today! Click here to see more info about the Penpal Hat. Click here to see our Retail Shops. 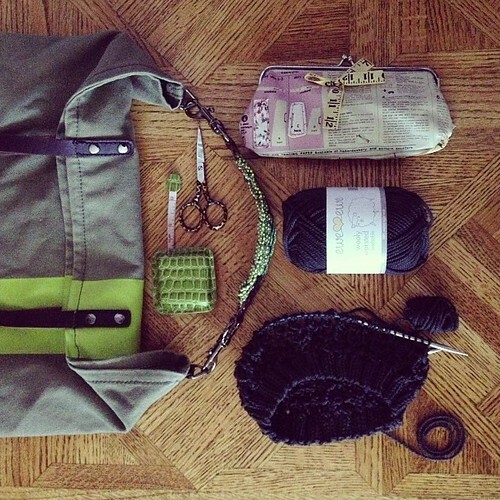 Wooly Wednesday: What's in my knitting bag? I love Wednesdays because that means it's Wooly Wednesday! That's our Ewe Ewe version of WIP Wednesday where I talk about what I'm knitting or my Work In Progress. This week I'm making a Penpal Hat. It's one of the first patterns I designed for Ewe Ewe and it is fun to knit. The Penpal Hat has a chunky lace pattern. It's hard to see the lace pattern in this photo but click over here to check it out. I'll be sure to show my finished version on the blog. Also, are you on Flickr? Yes? Come join the What's in my knitting bag group and post what you're working on every Wednesday!